When we as freelance designers think about networking, we generally think about meeting potential clients. However, today we’re going to talk about networking with people who might not be a client (hey, you never know) but can be absolutely essential in improving the quality of your work and increasing your success. And by networking, I don’t mean joining AIGA for the membership card. I mean REALLY networking – feeling comfortable contacting them out of the blue. You might look at fellow freelance designers as “the enemy,” but you’re missing out. While you’re always going to find at least one bad apple in every bunch, overall we’re a great bunch of people with amazing talents, ideas, and creativity. Friendly peers are invaluable. When you need advice and guidance from a real person, you’ll have resources to reach out to. Case in point: I’ve emailed all sorts of questions to peers all over the world. But more importantly, I’ve been able to use their experiences and advice to make my business smarter, safer, and more efficient. What’s a typical referral fee percentage? Have you ever run into <insert problem> with cross-browser compatibility? I’m tackling a project similar to your specialty and I have no idea how to price it. Can you help? What’s your favorite WordPress plug-in for <insert functionality>? My contract needs some work. Would you look at mine and tell me where you think the holes are? Hey, I’m really happy with where this project is going, but can you take a look at it? I’m rebranding myself…can you critique these logos? Do you know anything about preparing a document for offset printing? I have a high-maintenance client who <insert problem here>. Have you ever dealt with this and how did you do it? Do you know a good photographer/Drupal developer/video production company? Furthermore, by knowing trustworthy people with a wide variety of talents, you automatically have a go-to person who will give you a good price – or steer you in the right direction – on services you need. Just don’t forget – having a friendly peer means being a friendly peer. So the next time a confidante asks you for advice, respond kindly and truthfully in a timely manner. You can start right here on Millo! We’re a thriving community of freelancers who share tips and ideas (and sometimes commiserate!) everyday through blog posts and comments. Don’t be afraid! Strike up a conversation in the comments or contact someone whose responses intrigue you. True story: I met a fellow entrepreneur not ten minutes door-to-door from me right here on Millo. Do you have a network of peers you can reach out to for advice? How have they improved you or your freelancing business? Leave a comment on this post! This post couldn’t have come at a better time April! Lately I’ve been feeling un-inspired with my design work, and I’m really looking for ways to stay creative and unique amongst the many designs out there. I need to have to get a creative get-together with my friends from design school. Creative get-togethers are awesome! I’m looking to get involved in my new community (I’m changing states from Oregon to Colorado) so I can find some friendly creatives. Hi, April! I’ve been working as a freelancer for quite some years and only now i realised the importance of building a website and networking with other people in order to progress. Your article came when i most needed it. Thank you! I have a question about doing jobs for old family friends. I had an encounter where one did not expect me to take their demand for a drawing as a branding design job. What is a good way to transition relationships so they are clear that they need to pay you for your work. Well if you expect it to work you have to first establish the ground rules. You have to tell them from the beginning the project will cost and what it implies. If you do this in the first place then you can see their reaction and decide if you will continue or not. The best solution though is to avoid working with family because they will always expect you to lower your price for them. They think they are privileged because they know you. Hi, I had a similar case a few weeks ago. One of my closest friends asked me to do something for her boyfriend (who is also a friend of mine). She said that It’ll just take 5 minutes for you because it’s basically nothing. It’s a good chance practice (because I just started out a few month ago). I mean, the work wasn’t hard at all. But it’s NEVER 5 minutes. It was okay as a favor, but I don’t intent to do these types of “5 min” projects anymore. How can I respond if somebody asks me? I have a client looking for outdoor building signage for a new museum. I am excited to take on something new but unsure where to begin with the types of materials. What’s the best materials to hold up to weather in the west or other elements? What should I consider when designing signage. Designing a signage is a demanding as well as very fulfilling job. Luckily I have an article written about what to consider while working on a signage / billboard etc. Thanks for wrting this April. Published just in time as i just wonder what is a typical referral fee percentage of your project? I appreciate if anyone could give me a guide. Generally I don’t charge a referral fee, but I’ve worked out a referral program between myself and an IT guy that works out to 15% for either of us on the first project with a referral. It’s been tremendously profitable as he’s referred me multiple clients. It is a great post and it’s right on time. As I was taking out my garabage this evening I said to myself I’ve got to do a better job of networking in my industry..you’re right you need help or advice sometimes and it’s good to have a place to call. Cool article. I’ll be sure to check out your Millo Insiders later today. As usual great post April. I have experienced that having a good repo with other designers/programmers/photographers gives you extra confidence, because you have some one to go to if you are stuck. I also outsource tougher jobs like complex programming on a web page extra. This gives me more time and energy to concentrate on the quality of my work and the fellow peers get some extra cash! PS – If you’re ever short on people to outsource complex programming to, shoot me an email! I’d love to partner with you. 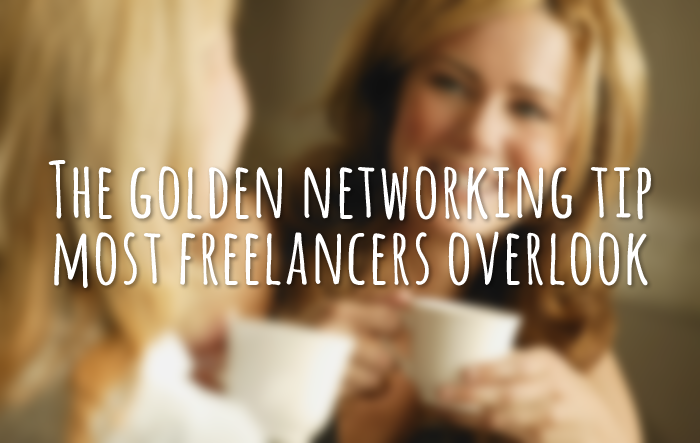 Proper networking can go a long way in securing potential clients and it is a very valuable tool for freelancers. Once can be extremely innovative and creative but he/she won’t be able to secure many clients without establishing a proper network. I was just thinking about this. I was recently introduced through email to another graphic designer in my city and I wanted to follow up with them but I have no idea what to say. Great advice April, over the last 12 months I have made some great creative contacts, from developers, photographers, illustrators and copywriters – Not only has it helped me in having some seriously talented people to call upon to help out on projects, but they recommend me to clients they work for – I have probably got 6 jobs over the last year I would never have been found for and now they provide ongoing referrals for me – And as we all know, they are the best adverts you can have. There are some who will connect with you specifically because your picture is unusual, and there are some that would never connect with you for the same reason. It’s up to you how you want people to perceive you, and what kind of clients you want to attract. I would choose a photo that your ideal client (and to a lesser degree, peer) would identify with, and if that’s the one you’ve already got, then you’re golden. Thanks April, I will be keeping it the same for now at least! Would you have any suggestions how to start up a graphic design business while being at full time university? (I study and live in Australia). I’m totally agree with you have a good working partner sort out a lot of complex situation and sometimes it’s also good to have some one can share a coffe and a beer with you just for a relaxing chat.